Wi-Fi is getting faster--again. Today Wi-Fi chipmaker Broadcom announced its first chips based on the coming 802.11ac standard, the successor to today’s 802.11n Wi-Fi. Products based on 802.11ac are expected to begin appearing late this year, delivering improved coverage and theoretical speeds up to twice those offered by the fastest 802.11n gear. Similarly, 802.11ac also offers a number of options, which are reflected in Broadcom’s first chip offerings. But all 802.11ac chips will all use the 5Ghz band, which is much wider than the crowded 2.4thz band and can therefore more easily support the 80mhz channels that contribute to 802.11ac’s speed boosts (802.11n channels max out at 40Mhz). 802.11ac also uses beamforming technology to achieve its faster rates and improved coverage. And because it is more efficient, 802.11ac takes less of a toll on battery life, a key attribute for mobile device use. 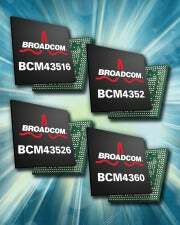 Broadcom’s fastest 5G Wi-Fi chip, the BCM4360, implements 3 spatial streams on a PCI interface to achieve maximum speeds of 1.3GHz. The midrange BCM4352 and BCM43526 chips support a two-stream implementation of 802.11ac for theoretical maximum speeds of 867mbps for use with, respectively, PCI and USB interfaces. The single-stream BCM43516 supports up to 433 mbps with a USB interface. The PCI chips are primarily for routers, access points and computers, while the USB chips are meant for consumer electronics such as TVs, Blu-ray players and set-top boxes. The name of the standard, 802.11ac, derives from the IEEE's convention of naming related standards as their working groups are established. With Wi-Fi, the IEEE had already exhausted single-letter suffixes (a through z) to 802.11 and had started all over again with two-letter suffixes--e.g. 802.11aa 802.11ab and now 802.11ac.